PDEA chief Aaron Aquino inspects packs of shabu seized during a raid on a house in Ayala Alabang, Muntinlupa City last night. MANILA, Philippines — At least 148 kilos of shabu worth P1 billion were seized by Philippine Drug Enforcement Agency (PDEA) personnel in a clandestine methamphetamine hydrochloride or shabu laboratory in a posh subdivision and a related sting in Muntinlupa City yesterday. 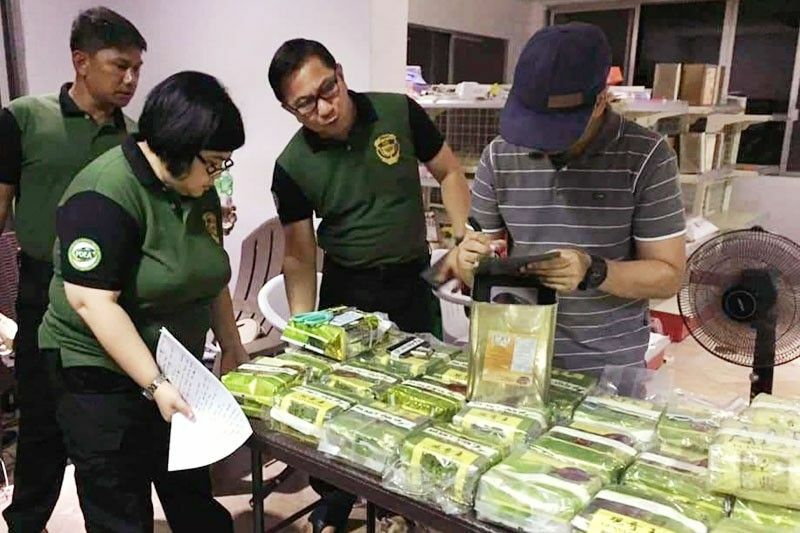 Around 123 kilos of shabu with an estimated street value of P836.4 million were recovered in Ayala Alabang Village at around 7 p.m.
PDEA director general Aaron Aquino led anti-narcotics agents in the raid on the house located along Apitong street. The raid stemmed from a drug bust at the parking lot of a shopping mall in Barangay Alabang the same day at around 5 p.m, said PDEA spokesman Derrick Arnold Carreon. Emerson Pascual, 79, were arrested after they sold shabu to PDEA operatives posing as drug buyers. Approximately 25 kilos of shabu worth P170 million were confiscated from them. Aquino said the Golden Triangle syndicate is likely behind the drugs, based on their investigation. According to Aquino, the drugs were placed in carton boxes and tin cans, a signature of the Chinese-run drug syndicate in other Asian countries such as Vietnam and Myanmar. He said the syndicate used the house as a storage facility for the drugs, which he suspects were about to be distributed to the streets of Metro Manila. “They chose this house because it is located in an exclusive subdivision, which is quite difficult to infiltrate,” Aquino said in a phone interview. The PDEA was still conducting an inventory of the drugs seized as of 8 p.m. yesterday.